The world’s major oil companies, the U.S. Chamber of Commerce, and the notorious Koch Brothers are pushing hard to get President Obama to approve a project that would have a devastating impact on our climate and environment. President Obama will decide, in the next month or two, whether to issue a Presidential Permit to allow construction of the Keystone XL tar sands pipeline. If built, the pipeline would transport up to 900,000 gallons of tar sands oil from Alberta, Canada, all the way to Texas coast refineries, 1500 miles south. The pipeline would pass through many fragile ecosystems, through farmland, and over the Ogallala aquifer, one of the largest aquifers in the world and a major source of drinking water in the U.S. The decision to allow or disallow the construction of this pipeline through the U.S. rests with the President. An executive order, in place since the 1960s, dictates that a U.S President should allow a pipeline to cross a U.S. border only if it is in the national interest. The President can act without Congressional authority. Tar sands oil, or bitumen, emits three times more greenhouse gases during production than does conventional gasoline. For every barrel of tar sands oil produced, three barrels of water are polluted and dumped into toxic pools. Tar sands extraction requires the strip mining of large tracts of pristine forest. A vast Canadian forest roughly the size of Florida is slated for extraction. Oil pipeline breaks are not uncommon. In the last decade, there have been 2,500 accidents in pipelines, resulting in 161 human deaths. Replacing the crude oil currently being used by refineries with tar sands oil will increase our greenhouse emissions by 38 million tons of carbon dioxide per year. This is equivalent to the emissions of 6 million cars. The extraction of tar sands oil is highly toxic to workers and others living nearby. Higher than normal levels of cancers, renal failure, lupus, and hyperthyroidism are all found near tar sands operations. Daily protests will continue through this Saturday, September 3. The protesters are serious. They have committed to complete non-violence, and they are willing to face arrest. To date, almost 400 of the demonstrators have been arrested for civil disobedience. Their illegal act has been standing or sitting still in front of the White House. On the first day, many people were arrested and held in jail for two nights. Since then, those arrested each day have been offered the chance to pay $100 in lieu of going to jail, explains my friend Nancy Kelly, of Alexandria, Virginia, one of those who has been arrested. Nancy is glad she is participating in the multi-day demonstration. “I’ve been so distressed and saddened to see our continuous reliance on oil, even though there are other alternatives available,” she says. Having signed numerous petitions and donated money to organizations working to halt climate change, she says the demonstrations and arrest have provided her a possibly more effective way to urge the President to avert a climate disaster. I urge all who care about the climate and the environment we are leaving our children to join Nancy and all the others who have been arrested. 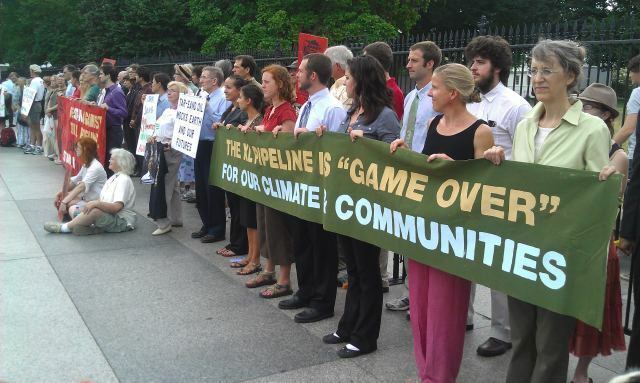 Please urge President Obama to say ‘no’ to the Keystone XL tar sands pipeline. Wendell Berry is one of my heroes. He writes lovingly and insightfully about the natural world. In this short excerpt, Berry helps me to think of soil in a new way. Soil seems humble; after all, it’s dirt. But what a powerful life force it is! A very small animal has just had a very big victory. In recent weeks, the Tulotoma Snail, native only to certain Alabama rivers, has been removed from the federal Endangered Species list. This elegantly spiraled, two-inch long snail is the only mollusk ever to rebound from the brink of extinction, once listed as Endangered. The Tulotoma Snail was once thought to have gone completely extinct. And one of the main reasons for the snail’s disappearance from Alabama waters was the large number of dams that had been built on the state’s rivers. The dams blocked water flow, necessary to carry oxygen to underwater organisms like snails. But then in 1991, a small Tulotoma Snail population was discovered along a leaking dam in the Alabama River. Not quite extinct after all, the Tulotoma Snail was added to the federal Endangered Species List. Once it became clear that there was a chance to save the Tulotoma Snail from extinction, dedicated conservationists and U.S. Fish & Wildlife Service biologists went to work. Invoking the Clean Water Act, which requires the implementation of water pollution control programs, federal officials requested that the Alabama Power Company install aeration systems to release steady flows of oxygenated water into the Coosa River. The power company, which had constructed the dams in the first place, complied with the request, and the subsequent increased flows of oxygenated water into the river helped spur the Tulotoma Snail’s rebound. The survival of the unassuming, mud-loving little mollusk will make Alabama’s river ecosystems healthier. Tulotoma Snails play a key role in creating a clean river environment, explains James Randolph in his Defenders of Wildlife blog. They are filter feeders that remove bacteria and algae from surface waters. With all the pollutants that enter rivers from natural and human-made waste, the water would be far more mucky and grimy without the snail and the other species that sanitize these streams, he says. The Tulotoma Snail is also an important food source for ducks, turtles, fish, and other animals. Without the snails, these animals might leave the river in search of other food sources, causing a further decline in the area’s biodiversity, Randolph notes. I know this is not nesting season for robins, but I was so charmed by this short video I received the other day that I want to share it. It amazes me how the baby robins can hold their mouths straight up and open them so wide. I guess the chicks have evolved to maximize their chances of getting the food they need. I have been curious about the creamy-colored, innocuous-looking butterflies I often see around here. I sometimes spot one fluttering among the plants by the road. Or I may notice a couple of them flying in small circles around each other until one heads off in another direction. These bland-looking little butterflies are called cabbage whites. And they are one of the commonest, if not the commonest, butterfly in America. I was surprised to learn that they are not native to North America but were accidentally introduced here from Europe in about 1860. They spread quickly and now are common throughout America. As far as I know, the cabbage white does not cause problems in ecosystems in which it has been introduced, and it is not considered an invasive speces. It is, however, considered a pest by growers of cabbage and other mustard family crops. Evidently, the cabbage white really does like cabbage; at least the caterpillar form does. The cabbage white’s creamy upperside is accented by black-tipped forewings. And it is easy to distinguish a male from a female; the male has a single black spot in the center of each forewing, and the female has two. The underwings of both sexes are yellowish with black speckles. Adult cabbage whites are diurnal, with mid-day the time they are most frequently seen flying. Some researchers add that cabbage whites may also fly during the night’s latest hours and then cease at dawn. And these non-showy creatures can be seen in just about any open spaces–fields, gardens, roadsides, waste places, parks, and cities. Adult cabbage whites get their food from flower nectar. Among their favorites are dandelions, purple loosestrife, red clover, asters, and mint. Cabbage whites are among the hardiest of butterflies. They are one of the first species to emerge from their chrysalis in the early spring, as early as late February, and they fly until mid-November or until the first hard freeze. The cabbage white starts life as an egg laid on the underside of a leaf of a host plant. Then, when the egg hatches (which can be pretty much anytime from late spring to late summer), and the caterpillar emerges, it begins eating immediately from the underside of the plant where it hatched. As it matures, the caterpillar begins to eat the leaf’s upperside. Looking rather leaf-like itself, the caterpillar rests along the leaf’s veins! The caterpillar grows rapidly and molts (sheds its skin) five times before it becomes a chrysalis. The chrysalis hibernates over the winter and, in the early spring, hatches into an adult butterfly. This touching little tale is from Teaching Your Children About God by David J. Wolfe. I imagine that anyone who loves nature can relate to it. “There is a wonderful Chasidic stoary about the child of a rabbi who used to wander in the woods. At first the father let him wander, but over time he became concerned. The woods were dangerous. The father did not know what lurked there. “”Yes,” the boy answered. “But I’m not.”"
Over the last few years, I have learned about invasive plants in our yards and woods and about why exotics are a problem. Now I am learning about something I never even knew existed–invasive species in our oceans! According to David Helvarg, an ocean conservationist and author of Fifty Ways to Save the Ocean, “invasive species have taken up residence in United States waters and have eaten, displaced, spread disease to, or otherwise threatened native creatures and their habitats.” In San Francisco Bay, a particularly damaged area, more than 130 invasive species are threatening the survival of the entire native ecosystem, Helvarg explains in his book. How do all these invasive species get into our waters? The major way, apparently, is through the arrival of large ships. Before launch, ships typically take in a large amount of water as ballast, to stabilize the ship. Then when the ship arrives at its destination, the ballast water is released. 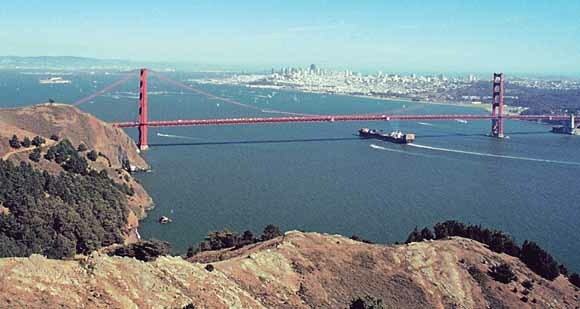 Every day, millions of gallons of ballast water are released into U.S. ports, harbors, and bays. And contained in this water are many foreign marine species–from plankton to clams to predator fish. Commercial ships aren’t the only way invasive species enter our waters. Small boat operators, fishermen, divers, pet owners, travelers, aquarium owners, even seafood lovers, are also sources of invasive species in our marine waters. An exotic invasion can occur when people dump plants, algae, or even empty shells, which may contain living larvae, into bodies of water that did not harbor them before. “Something as innocuous as an outboard motor or scuba tank, if not properly washed first, could transport an invasive species when it it is moved from one ocean to another,” Helvarg explains. Don’t flush kitty litter down the toilet. Cat feces contain toxoplasma, a genus of deadly pathogens that, along with opossum droppings, have been found to be one of the causes of sea otter deaths off the California coast. Kitty litter can also clog the toilet. After eating seafood, don’t dump oyster shells or other shellfish or seafood waste in the water. They may contain live ‘spat’ (shellfish larvae), pathogens, and parasites. When I am feeling angry and distressed about what’s going on in Washington, the best antidote I know is to go down into the woods. I know that even a little forest time will rejuvenate my spirit. The other morning was no exception. I walked from our house down into the woods and eyed one of my favorite resting spots—a glade (isn’t that a great word!) where long, dry stalks of grass leaned this way and that. I chose a reasonably flat spot among them and laid down on my back. Every time I lie down in the forest, I am amazed anew at how good the ground feels under my body. Silently, it seems to impart sustenance and strength. Enjoying the firm earth beneath me, I looked up. Mostly I saw the highest leaves of the tallest trees, gathering around a small space of sky. And in that blue opening, a wispy cloud hurried east. A hawk, wings spread, glided through, disappearing again behind the leaves. Those leaves are a wonder. The farther down the tree trunks, the darker green the leaves. These leaves live in the shadow of their ‘higher-ups.’ The higher the branches, the lighter and brighter their leaves. These are the ones that receive the most direct sun. And as those high-up leaves rustled in the breeze, they shifted about, trading translucence for shade and back again. Some leaves were partly shaded and partly shining at the same time. I closed my eyes. The sounds of the living forest pleased me. From up the hill came an avian chortle. It must have been a wild turkey. The chortles continued, each one fainter and more distant, until they died out completely. A woodpecker pounded its beak against a tree somewhere to my right, another off to the left, here and there, sometimes muffled, sometimes pronounced. On a recent summer day, I enjoyed a sunny stroll along our overgrown hill once known as the orchard. Here and there, dotting the ground and glistening in the sunshine, were ragged, gauzy-looking little ‘blankets.’ Many were stretched out flat, little trapezoids close to the ground. Others were more free-form, appearing to be stuffed between the base of a tree and a clump of weeds, or between a wide rock and a tall plant. Some of these gauzy coverings sported renegade threads that stretched upward in different directions. A prominent feature in many of these little ‘blankets’ was a dark hole. Not formed by a tear in the ‘blanket’ but constructed by the weaving of threads around a space that descended in darkness, the hole was actually a funnel. The presence of this funnel was not obvious in many of the gauzy patches, but a little attentive looking usually revealed a funnel’s presence. I knew that these translucent, white patches were spider webs. But I didn’t know anything about the spiders that made them or what the funnel was for. So I decided to do a little research. It turns out that the funnel webs in our yard were made by grass spiders, members of a large family of arachnids called Agelenidae, or funnel web weavers. 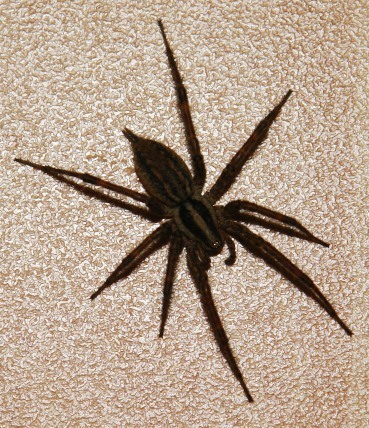 A brownish or greyish spider, the grass spider may reach a size of about 3/4 inch. It is one of about 400 species of funnel web weaving spiders found in North America. These spiders typically live in fields and around homes. The webs we sweep off our outdoor decks and porches are likely the webs of funnel web weavers. Unlike orb spiders who create a circular, ‘spoked’ web that traps prey in its sticky threads, funnel web weaving spiders are hunters. The orb spider senses the vibrations of a struggling insect caught in its web. But the funnel web weaver’s web is not sticky. This spider depends on its great speed and its relatively good eyesight to catch its food. An insect flying over the funnel web weaver’s web may hit one of those ‘stray’ threads and get knocked down onto the web. Before the insect can fly off again, the spider darts out of its funnel, spots the insect with its eight eyes, and dashes across the web to bite the insect, thus paralyzing it. The spider then drags the insect down into the web’s funnel to devour it. You are currently browsing the Earth Connection blog archives for August, 2011.